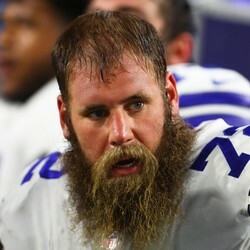 Dallas Cowboys center Travis Frederick has been diagnosed with Guillain-Barré syndrome, a rare neurological disorder in which the body’s immune system attacks the peripheral nervous system. Frederick released a statement saying he does not know when he will return to the field. Frederick's statement is both worrisome and optimistic. While he notes that doctors do not have a timetable for his return, he expresses that he is already feeling better after receiving treatment over the past few days. Frederick has yet to miss a game in his five-year career, but at this point, he is not a lock to be ready by the season opener. Losing Frederick would be a huge blow to quarterback Dak Prescott and running back Ezekiel Elliott as they look to rebound from a disappointing 2017 season.